Originally published under the title "Turkey: 'A Great Muslim Democracy'?" According to Jeffrey Goldberg, "Early on, Obama saw Recep Tayyip Erdoğan ... as the sort of moderate Muslim leader who would bridge the divide between East and West ... Obama now considers him a failure and an authoritarian." Can there be democracies and democracies with religious prefixes? Is the United States a democracy or a Christian democracy? Is Israel a democracy or a Jewish democracy? Is Japan a democracy or a Shinto democracy? In a 2010 interview with the Italian daily, Corriere della Sera, U.S. President Barack Obama referred to Turkey as a "great Muslim democracy." In the same interview, he said that: "The U.S. always expressed the opinion that it would be wise to accept Turkey into the European Union." All that was music to Turkish ears. But in reality, the president of the United States was suggesting to Europe's rich club of nations that it must admit as full member not a democracy but a "Muslim democracy." Obama did not understand that Turkey could never join the EU before it has fully transformed from being a Muslim democracy into a democracy. In later years, though, Obama would painfully understand the difference between a democracy and a Muslim democracy. Now, in the words of James Jeffrey, a former Obama administration ambassador to Ankara, "You have to deal with the Turkey you have, rather than the one you'd like to have." 'You have to deal with the Turkey you have, rather than the one you'd like to have,' says former U.S. ambassador James Jeffrey. Obama's reference to Turkey aimed to please the political elite in Ankara. Soon after his 2008 election, Obama began to cultivate a private relationship with President Recep Tayyip Erdogan (who was then Prime Minister). In a 2012 Time interview, Obama named Erdogan as one of the five world leaders with whom he had the strongest bonds. In 2011, Tom Donilon, the president's former national security advisor, said that Obama regarded Erdogan as "a man of principle, and also a man of action." Things look different today. "We basically have turned a blind eye to Erdogan's drive towards an authoritarian, one-man system of rule in Turkey," said Eric Edelman, who was U.S. ambassador to Ankara from 2003 to 2005. Obama persistently lived in this make-believe world until very recently. Jeffrey Goldberg wrote in The Atlantic's April 2016 issue: "Early on, Obama saw Recep Tayyip Erdoğan, the president of Turkey, as the sort of moderate Muslim leader who would bridge the divide between East and West ... But Obama now considers him a failure and an authoritarian." Recently Erdogan, his ministers, intelligence chief, senior military officers, and top diplomats were in New York for the 71st Session of the United Nations General Assembly. There were bilateral talks between the Turks and Americans, too. Once staunch allies, Turkey and the U.S. now have more divergences than convergences. The Turks vehemently demand the extradition of Fethullah Gulen, a Muslim preacher in self-exile in Pennsylvania since 1999 and the prime suspect in the July 15 coup attempt against Erdogan's government. U.S. officials tell the Turks that it is the independent U.S. courts that will decide, based on the evidence provided by Ankara. The Turks do not understand that a court can decide something independently of the country's elected president. "We want a terrorist from you ... And you still resist ... What court? What court for a terrorist [Gulen]? Is it too difficult to cancel a Green Card?" Erdogan said. Apparently, Erdogan thinks that the U.S. is ruled as Turkey is ruled. He does not understand that the president of the United States cannot phone a judge and order an arrest warrant for a foreign national. He does not understand that in the U.S., the administration cannot decide who is a terrorist and who is not without a court verdict. In Turkey, the government does. 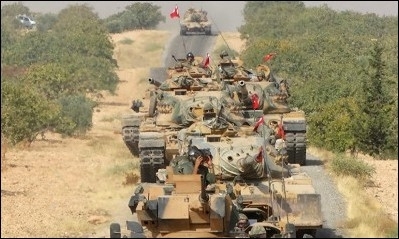 Turkish tanks moving into Syria on August 24. Gulen has become a hot potato in the hands of the U.S. administration officials. But he is not the only headache for Washington. Turkey keeps warning Washington that it should not ally with Syrian Kurds whom Ankara views as terrorists -- Washington views them as militias fighting the Islamic State (ISIS). On August 24, Turkish troops began a military incursion into northern Syria to support the "moderates" it backs, and to push ISIS strongholds farther south. Meanwhile, as part of a broader land operation further south into Raqqa (ISIS's main stronghold), the U.S. is arming Kurds, angering the Turks. "We cannot say anything at the moment as we have not clearly seen the attitude of the U.S. But Turkey will not be part of an operation if the U.S. wants to conduct it with the PYD and YPG [Syrian Kurdish groups]," Erdogan said. Not enough trouble? Erdogan also asked Vice President Joe Biden about the arrest of the Iranian-Turkish businessman, Reza Zarrab, who has been in a U.S. jail since March on charges of money laundering and sanctions evasion. 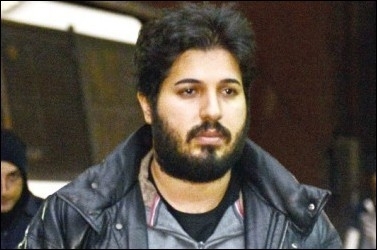 Turkey wants accused money launderer Reza Zarrab released from U.S. custody. Erdogan wants the U.S. judiciary to release the shady businessman, who was one of the key interlocutors in a December 2013 corruption scandal in Turkey involving Erdogan and four of his cabinet ministers. In my talks with Biden, I also brought up the Reza Zarrab issue when the judiciary subject was raised. The court which the U.S. Department of Justice referred this case to is also interesting. Both the prosecutor [Preet] Bharara and judge Richard Berman are names who had previously been hosted by FETÖ [the Turkish acronym for the alleged terrorist organization operated by Gulen] in Turkey. In other words, the U.S. Department of Justice handed Zarrab over to names which FETÖ had wined and dined. Erdogan claimed that Zarrab had not committed any crime, according to the findings of multiple Turkish ministries. He added that Turkey would not remain insensitive to the arrest of any of its citizens in another country. He added: "That person [Zarrab] is a citizen of the Turkish Republic ... According to what rule had that arrest been made?" Once again, Erdogan wants to take up the powers of U.S. judges and announce verdicts on their behalf, as he can always do in Turkey. But he does not understand that things work differently in the U.S.
As prominent columnist Tolga Tanis wrote in Hurriyet: "There is no doubt that the Turkish-U.S. relations, just before presidential election in the U.S. in November, are passing through a critical junction. There are no traffic lights at the junction. And both sides are running fast without slowing down."